COL is a map-colouring game, attibuted to Colin Vout. 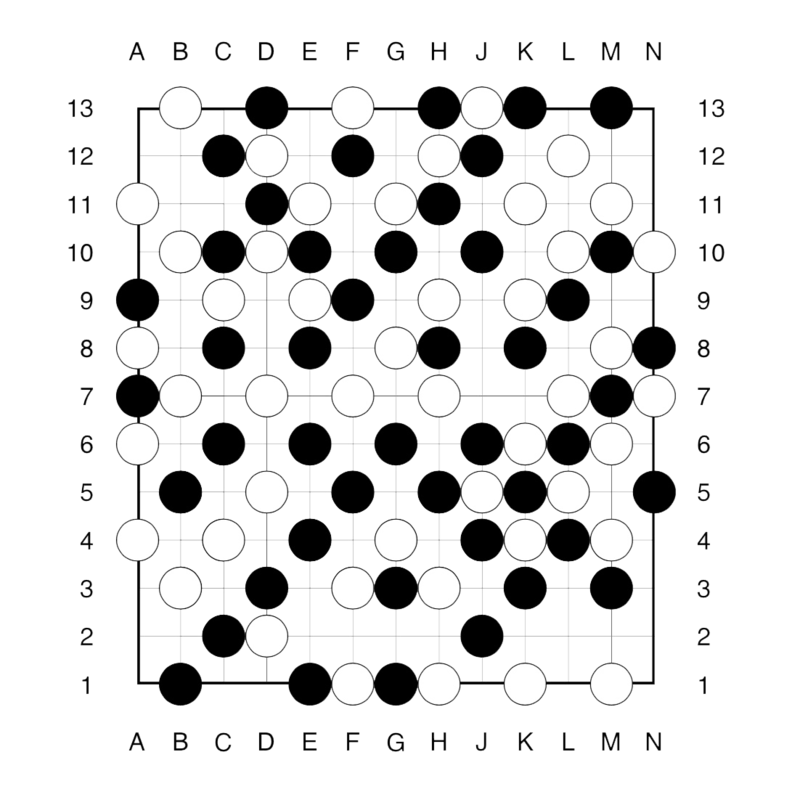 COLgo is COL played with Go-stones on a go-board. The two players, bLack (left) and white (right) take turns placing a stone of their colour on the board, but two stones of the same colour may not be next to each other. The first player unable to make a legal move looses this game. – fuzzy, if there is a winning strategy for the first player. Here’s an endgame problem: who wins this game? First we can exclude all spots which are dead, that is, are excluded for both players. Example, F11 is dead because it neighbors a black as well as a white stone, but F10 is alive as it can be played by white (Right). If we remove all dead spots, we are left with 4 regions (the four extremal corners of the board) as well as 5 spots, 3 for white and 2 for black. That is, the game reduces to this “sum”-game, in which a player chooses one of the regions and does a legal move in that component, or takes a stone of its own colour from the second row. Next, we have to give a value to each of the region-games. – the right-most game has value $0$ as the second player has a winning strategy by reflecting the first player’s move with respect to the central (dead) spot. – the left-most game is equivalent to one black stone. 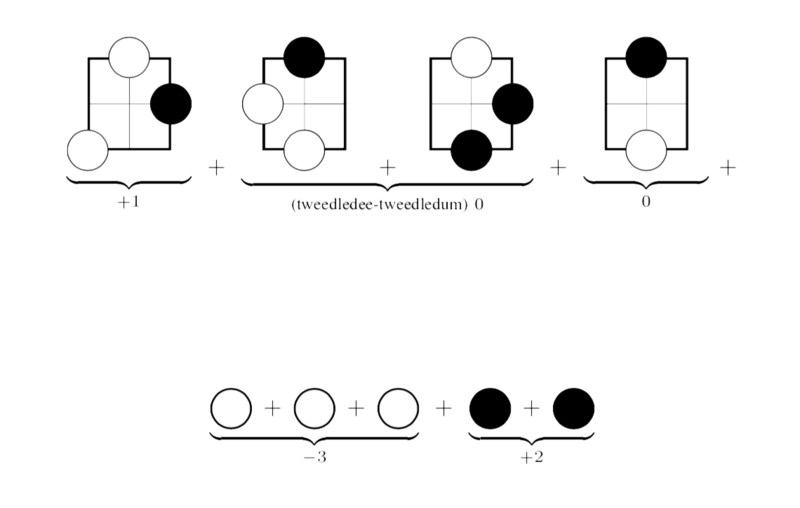 Black can make two moves in the game, independent of the only move that white can make. So it has value $+1$. 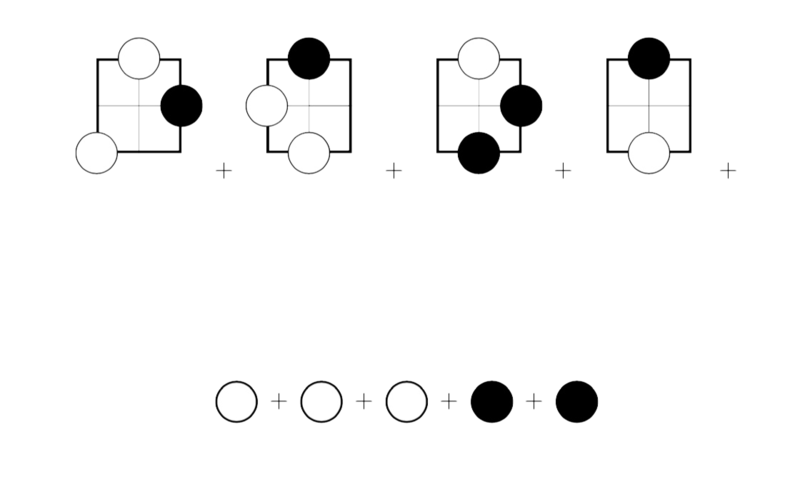 – the sum-game of the two middle games has value zero. The second player can win by mirroring the first player’s move in the other component. This is called the Tweedledee-Tweedledum argument. zero, so the first player to move looses the game!